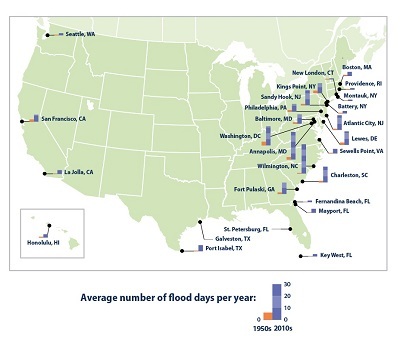 ﻿ Fun Easy English - Environment - Global warming - Climate change Indicators: Coastal Flooding. 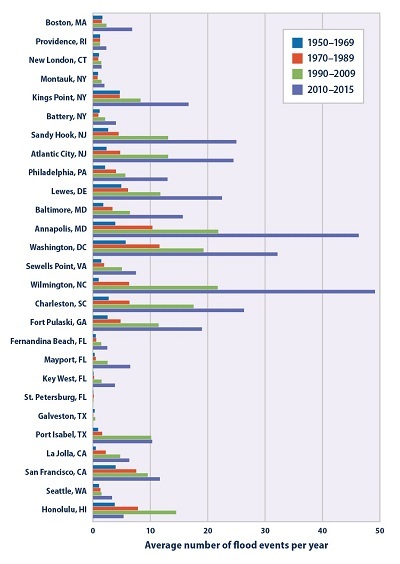 Many coastal cities have defined minor or “nuisance” flooding thresholds. When water rises above this level, minor flooding typically occurs in some streets, many storm drains become ineffective, and a coastal flood advisory may be issued. 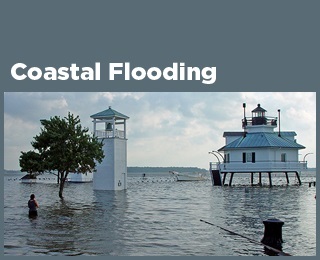 Recurrent coastal flooding can cause impacts such as frequent road closures, reduced stormwater drainage capacity, and deterioration of infrastructure not designed to withstand frequent inundation or exposure to salt water. These impacts are of particular concern because more than 8.6 million Americans live in areas susceptible to coastal flooding, and more than $1 trillion of property and structures is within a few feet of current sea level.1 Coastal flooding can also affect human health—for example, by increasing the risk that drinking water and wastewater infrastructure will fail, putting people at risk of being exposed to pathogens and harmful chemicals.